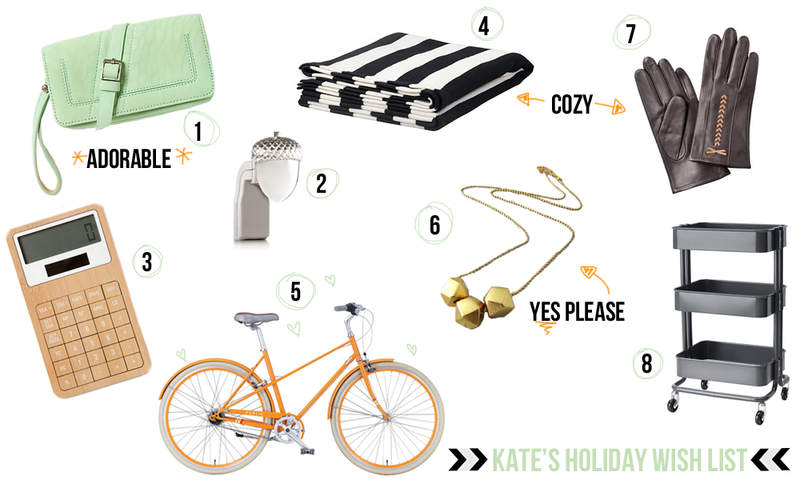 A Creative Cookie: Kate's holiday wish list. Wow, nine days until Christmas! These past few weeks have flown by. I really need to go make some more gifts, but I thought I'd throw together a fun wish list. Some of these things really are wishes, but everyone can dream, right? So this year I'm diggin' fun bauble necklaces, wristlets, cozy throws, and bright bikes. And that shiny acorn up there? Bath and Body Works have "Wallflower" fragrance plugs (In shapes of flowers, acorns, leaves, etc) that make rooms smell rosy.